This exhibit was created in 2005 by Mary D. McConaghy and by Michael T. Woods, University Archives Summer Research Fellow and an undergraduate at Penn State University, from research compiled by Cappy Gagnon and other members of the Society for American Baseball Research (SABR). Penn won 15 games, lost 9, and tied 2 this season, avoiding shutouts all year, and scoring 7.4 runs per game. They were 2-2 on the southern trip this year with wins over the University of Virginia and the United States Naval Academy. One setback this year was due to the absence of their pitching ace, Theodore Brown, who turned heads last year with his magnificent arm, but was unable to play this season due to parental objections. If he was able to play, it is conceivable some contests would have ended differently. One member of this team, Francis Patrick Leary, began playing professional baseball in 1902, the same year he switched from the College to Law School. He earned his law degree in 1904 and continued to play professional ball until his death in 1907. Note that the list of team members varies slightly from source to source. 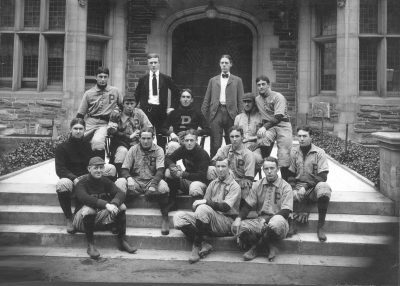 Included here is everyone named in the 1900 yearbook, the Athletic Association history of Penn athletics published in 1913, or both.